Can Arnold Schwarzenegger Persuade China To Eat Less Meat? : The Salt Like the U.S., China is battling obesity and climate change. So it's urging citizens to eat less meat — and spreading the word with public service ads featuring Hollywood stars. A vendor sells meat to a customer in a food market in Huaibei, Anhui, China, in February. Just as the U.S. is battling diet-related diseases, obesity and climate change, so, too, is China. And among the proposed strategies to combat these problems is this: Eat less meat. 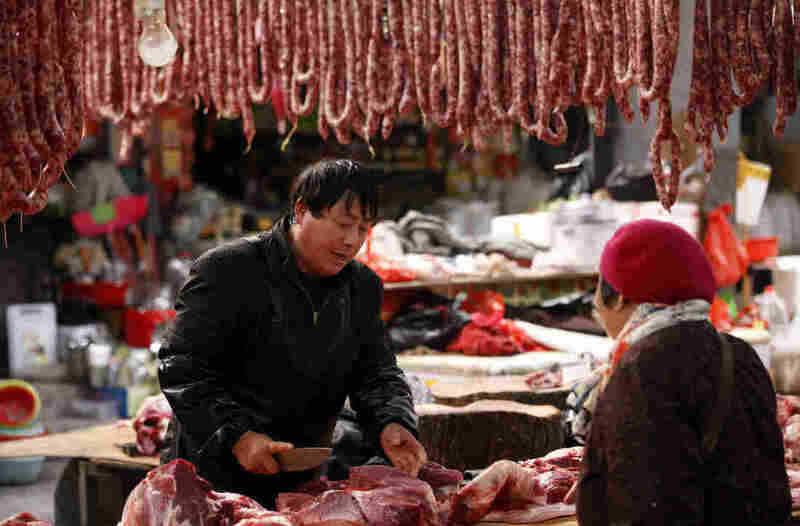 The recently released Chinese Dietary Guidelines nudge Chinese consumers to cut back on meat. The recommendation sets a new lower target of daily consumption. The guidelines come at a time when China's rate of obesity and diet-related diseases are on the rise. The WHO says China is seeing an explosive growth in diabetes, and a paper published in The Lancet found 28 percent of men and 27 percent of women in China are overweight or obese. Now, Hollywood's Terminator star, Arnold Schwarzenegger, wants to help persuade the people of China to pay attention. "I'm slowly getting off meat," Schwarzenegger says in this video created by the advocacy group WildAid. "And ... I feel fantastic." The big-screen actor is teaming up with WildAid to produce public service ads targeted at Chinese consumers. The group has partnered with the Chinese Nutrition Society, a nonprofit professional organization in China. Schwarzenegger is joined in the video by filmmaker James Cameron, of Titanic fame, who makes the link between meat-eating habits and climate change. "How can I call myself an environmentalist when I'm contributing to environmental degradation by what I eat?" Cameron, a longtime advocate of veganism, asks in the video, as the two make the case to reduce meat consumption. The Chinese eat more pork per capita than Americans, according to the Organisation for Economic Co-operation and Development. China now accounts for half of global consumption and production of pork, according to a 2014 report from the USDA. And pork imports have been growing at an annual rate of 150 percent. China is among the nearly 200 countries that committed to reducing greenhouse gas emissions at a conference in Paris in 2015. Given the role agriculture plays in producing greenhouse gas emissions, there's now a global conversation about ways to promote sustainable diets that lead to fewer emissions. China's National Center on Climate Change Strategy and International Cooperation has signaled its support of the plan to raise awareness about the links between food and climate change. "Tackling climate change involves scientific judgment, political decisions, entrepreneur support.But at last, it still relies on involvement of the general public to change the consumption behavior in China," Li Junfeng, director general of the climate change center, writes in a comment published on China Climate Change Info-Net. The website is run by the National Development and Reform Commission in China. "Every single one of us has to believe in the low-carbon concept and slowly adapt to it," Li Junfeng concludes. WildAid says it has an extensive network of media partners in China including CCTV, Xinhua and many other outlets. "We are working to get these PSAs on as many as possible," says the group's John Baker. WildAid says campaign billboards are confirmed for placement in every province and autonomous region in China. China has used celebrity cachet to drive environmental campaigns before. For example, Yao Ming, the nation's famed basketball star, has spoken out against the shark fin and elephant ivory trades. While the voices of Schwarzenegger, Cameron and actress Li Bingbing, one of China's favorite screen stars, have lent weight to the campaign to reduce China's meat consumption, it's unlikely the Chinese will pay attention, argues Jeremy Haft, a China expert and author of Unmade in China: The Hidden Truth about China's Economic Miracle. "The guidelines are merely suggestions and basically unenforceable," Haft told us. "All indicators point to the continued steep growth in China's demand for meat." Haft says eating meat is now viewed as an important part of a middle class diet. In essence, he says, having pork on the table is a sign of social status. Rachel Liang contributed to this report from Beijing. Alastair Bland also contributed to this report.